Messages of love and gratitude shared by the boy band One Direction topped Twitter's charts this year, eclipsing President Barack Obama's celebration of the U.S. Supreme Court's decision legalizing gay marriage. 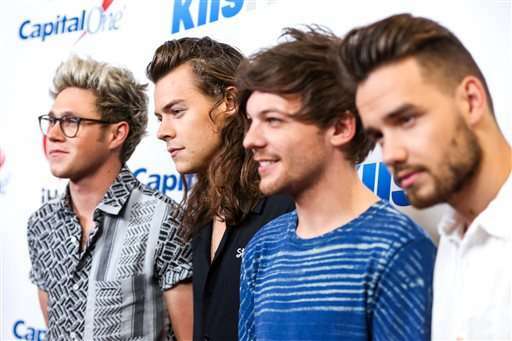 One Direction members accounted for half of the 10 most recirculated tweets, including the three most popular. All the One Direction tweets were either directed at bandmates or the group's fans. None are likely to be remembered for heralding pivotal moments in history. "All the love as always. H," One Direction's Harry Styles tweeted in March after Zayn Malik announced plans to leave the group. Styles boasts 26.3 million Twitter followers. The band's other current and former members have amassed between 16.6 million and 23.7 million followers apiece. Obama nabbed the fourth spot in the Twitter rankings released Monday with a June 26 tweet that hailed the Supreme Court's ruling on gay marriage as "a big step in our march toward equality." Other tweets in Twitter's Top 10 came from Saudi Arabia King Salman after his crowning, hip hop personality Kayne West calling for people to do everything they can, actor Leonard Nimoy philosophizing five days before his death and Caitlyn Jenner introducing herself after her transition from one-time Olympic decathlon champion Bruce Jenner. Twitter also released some of the most popular topics, denoted by hashtags, that resonated with the more than 300 million users of its short-messaging service. The list included (hashtag)JeSuisParis after last month's terrorist attack in France, (hashtag) BlackLivesMatter after police shootings of African-Americans in several U.S. cities, (hashtag) LoveWins after the Supreme Court's ruling on gay marriage and (hashtag) RefugeesWelcome as people fled the Middle East for Europe. Although Twitter Inc. has built a big audience, Facebook's social network is five times larger. A list about what people were talking about on Facebook this year is expected to be released soon, too.